We’ve been back in MdR a month or so now and have been getting on with putting Emerald to bed, cleaning and removing sails, washing the dinghy and kayaks for storage and servicing and winterising the generator, outboard and main engine. 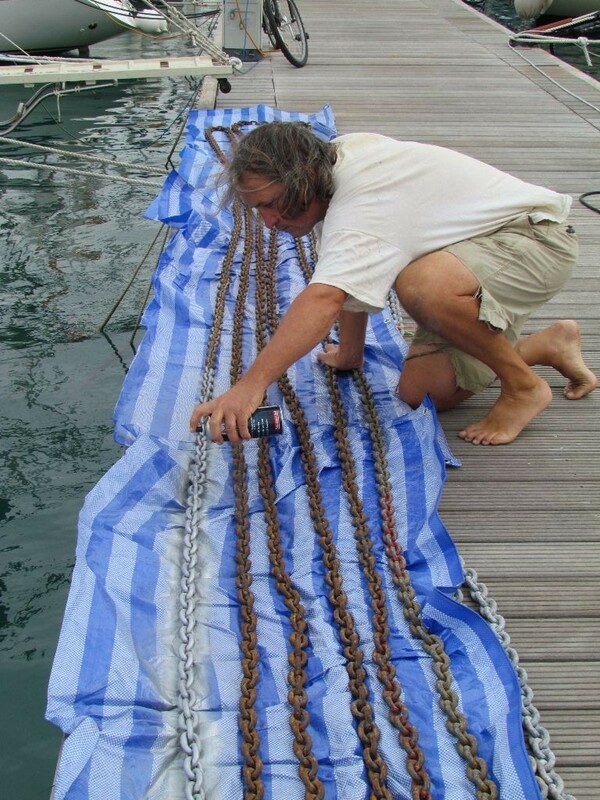 The anchor chain has been pulled out of the anchor locker and carried along the deck to the pontoon for it’s annual service. 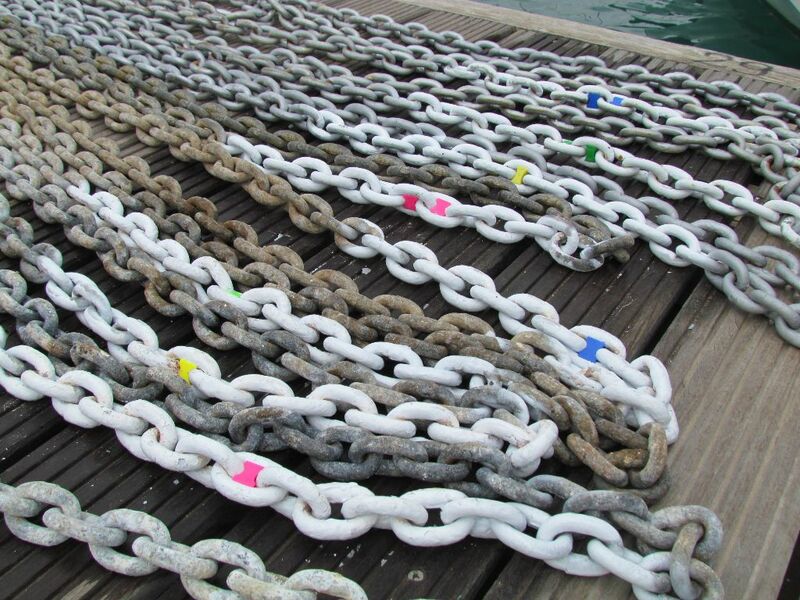 A scrub with fresh water, a good check of the shackle and chain, a paint with zinc spray paint (this is to protect it whilst in the anchor locker so that it doesn’t meld into a solid lump whilst not in use for six or so months) and remarking the 5m and 10m points. We paint each 10m mark white to alert us to be on the lookout for the plastic chain markers; a single coloured chain marker in the sequence pink, yellow, green, blue then double colours for 50m onwards. It’s sort of the order of the rainbow (pink is close to red) and is a sequence we can remember – Richard Of York Gave Battle In Vain has somehow stuck in my head since school days! The chain markers we use are the ones which clip into the space inside each link, they have lasted really well for us and only break when we need to remove them. Then for the 5m inbetween the white marks we spray red. The paint just about lasts a season, well enough that we can still count lengths at the end of the summer. This year we are turning the chain around so that what was the end is now the start of the chain. Since we bought this chain, adding up the number of days we’ve spent on the hook comes to nearly three years with the first 50m taking the brunt of the use, whereas the last 50m hasn’t spent that much time in the water. By turning it around we’ll get a few more seasons use before getting the whole chain regalvanised. We’ve had quite a few storms pass though, one which sent a fierce gust wizzing by as we were waking up and tipping Emerald over a few degrees. We measured 78 knots that day, the highest we’ve ever recorded. But between the storms there have been plenty of hot, sunny and dry days too. The town is winding down after the summer season but still with plenty of people out enjoying a promenade along the seafront on the weekends and evenings. A film crew has been in town, filming what we think is a new season of Montalbano. We have been welcomed back to the Stella Marina Bar with the addition of a bigger TV for us to be able to watch the rugby world cup on and Happy Hours had kicked off there even before the end of September and as always they look after us there very well. The Happy Hookers craft group is well attended and I’m challenging my brain to think differently at the writer’s group. Cost – last winter we were offered the same rates at MdR if we paid the deposit for another winter. 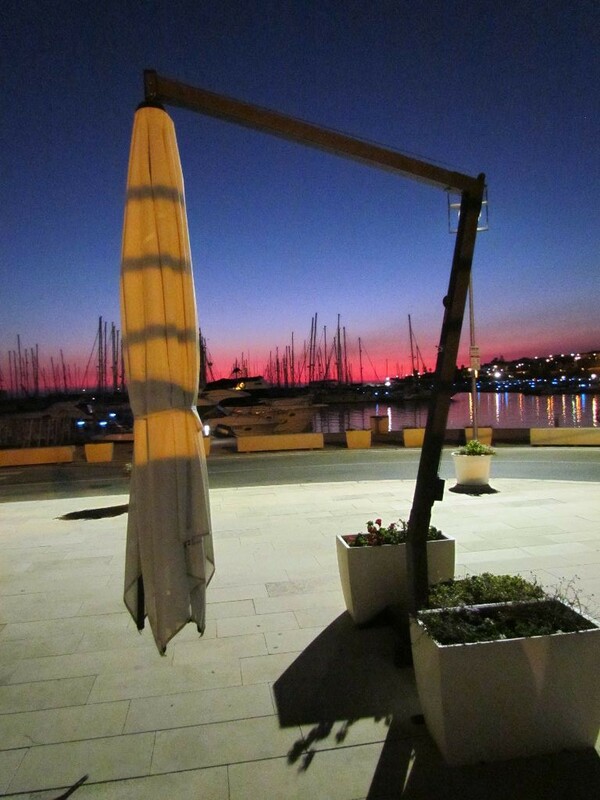 We considered other marinas in Greece but could find nowhere that provided such good value on cost. When we looked into Turkey, the additional cost of health insurance for both of us to apply for a residency permit to allow us to stay longer than 90 days would have added a fair chunk of pounds on. Given that we need to carry out some work out of the water on Emerald next spring, our savings couldn’t take the extra hit for Turkey this year. Social life. Having had such a great last winter here we knew there was a good chance this year’s could be as good. With new people arriving there would be the opportunity to make new friends as well as catch up with friends made last year. Six months is a long time and a social life is important to us. There is around 100 or so boats wintering here from many nationalities and a vast range of skills and knowledge to be shared. Weather. Although we did have wet, stormy and cold days last winter in Sicily, overall the weather on the south coast is better than further east in the Mediterranean. Travel to UK. With EasyJet now flying twice a week throughout the winter from Catania to Manchester, it makes getting back to the UK to visit a pretty straight forward process. Sicily – we didn’t quite get to do all the touring around Sicily done last year so this year we want to catch up on the places we didn’t get to see. The people here are so friendly and welcoming too, it will make the day we leave for pastures new very tough. Some people never go back to the same place twice, others come back year after year. There are no rules, we did what was right for us and so far it’s proved to be a good decision. 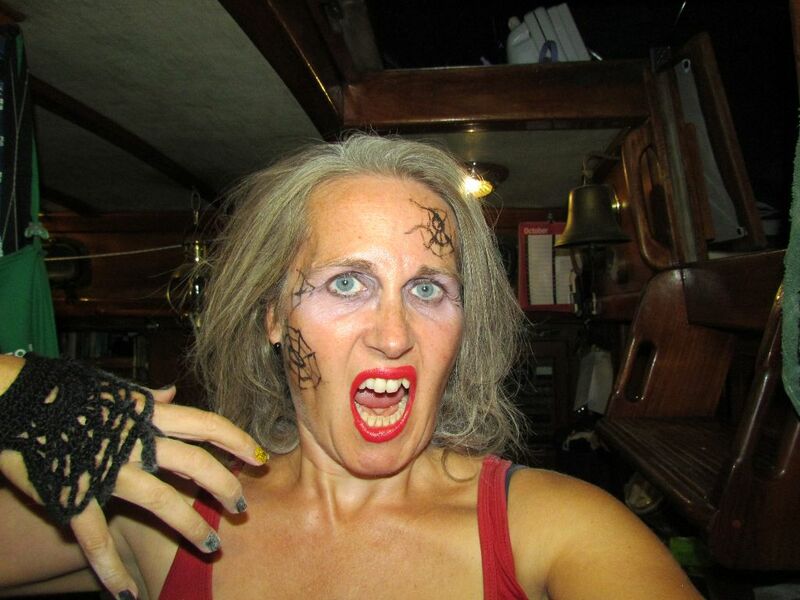 The marina meeting room was transformed into a spooky chamber for some devilish tunes and karaoke with a ghoulish poComing of themed snacks and cakes. I transformed into a scary spider for the night! Having thrown us an excellent farewell BBQ in the spring, the marina made the most of the excellent weather with a welcome BBQ. Sicilian sausages sizzled on the grill, the table was loaded with lasagne and Sicilian focacia and to finish it all sweet ricotta filled cannoli, all washed down with lager and wine. 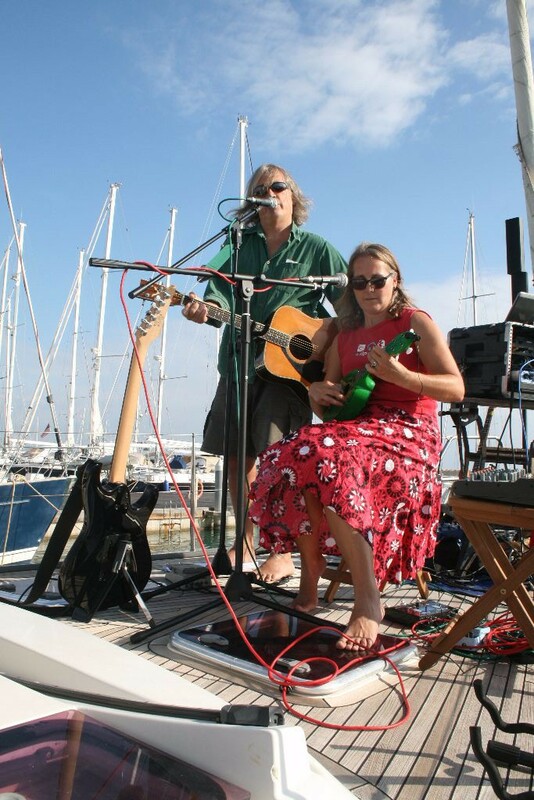 Making the most of the great weather, a Sunday music afternoon was planned on NAOB, one of the boats along our pontoon. The foredeck was transformed into the stage and spectators gathered in the cockpit and along the pontoon. Richard and Stefan provided some rocking electric guitar tunes, Colin contrasted with some acoustic folk and americana. It was great to have a reason to practise again and Colin has now been inspired to learn a whole load of new songs. Having barely been out of it’s case all summer (except for an attempt to make some people anchored too close go away) the wee green ukulele machine was broken out for a couple of songs too! Good to see you got back safely again and that Colin has you chained up. 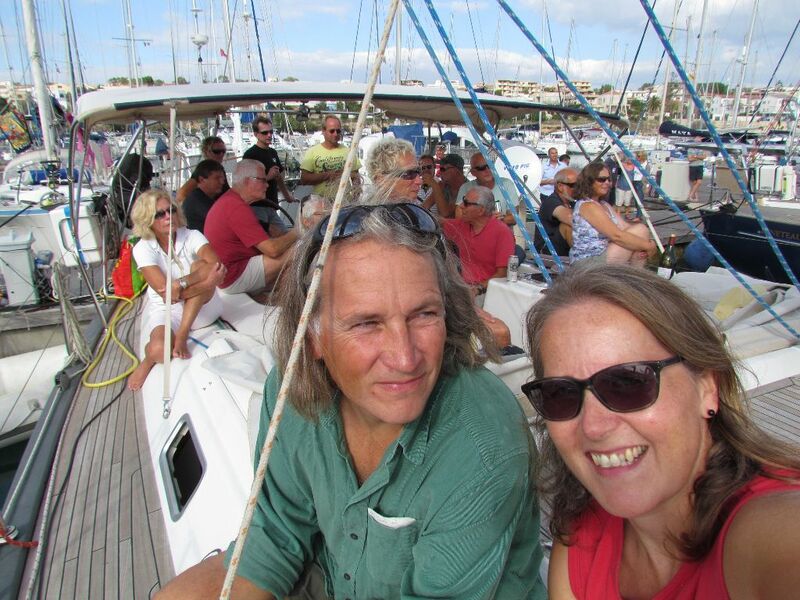 Living aboard is like living two different lives, the summer cruising and the winter fixing and socialising. Good to see you are enjoying both and enjoying life. I enjoyed reading the blog. Have an amazing winter my friends. Hi Mark and hello to Angelina too. Thanks for the comment, it is always nice to hear from anyone out there. I’m now doing one morning a week on the net and as you may remember the silence sometimes is deafening 🙂 Enjoy your winter too, we look forward to reading of your adventures!